The blue hydrangeas are the ideal flowers to decorate the garden or the interior of the home and of the year. The deep color of its petals not only transmits a sense of peace difficult to describe, but its aroma can create a very pleasant atmosphere. Even in the most austere style, the characteristic blue color of hydrangeas can fill the environment with vitality thanks to its vividness and energy. Here, we explain the blue hydrangeas care methods and steps. So, you can enjoy them in all their splendor. The blue hydrangeas are delicate flowers that you must take care of with care. It is not recommended that you have your plant in extreme weather or with excessive heat or too cold, as this can wither the flowers prematurely and even cause the plant to die. 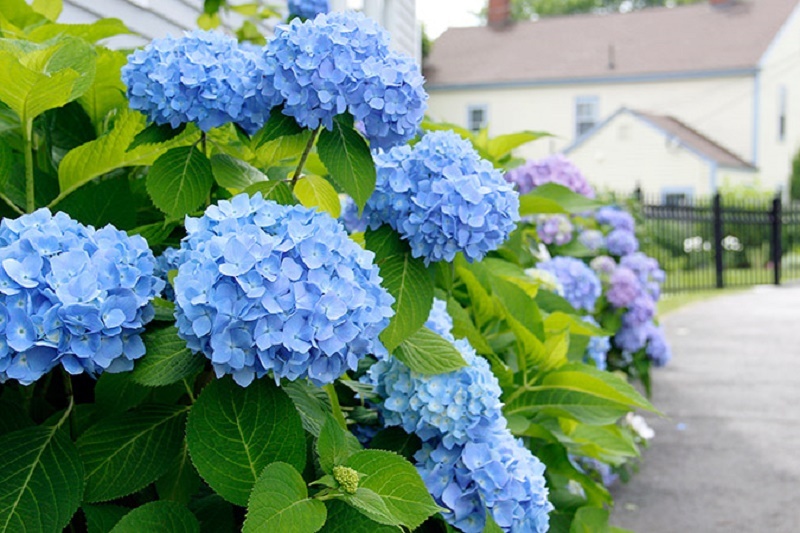 It is also not good to plant your hydrangea in soil with little drainage because excess moisture can break down the roots of the plant, facilitating the formation of fungi and pests that inhibit their growth, and can even kill the plant. So, make sure it has good drainage. Also, it is a plant that needs a lot of water. It is recommended that it grow in an environment with humidity but without excess. Apart from these basic care and those that we will specify in the following lines, we advise you to read this other article on How to care for hydrangeas, in which we talk about this species in a more general way, and that can be useful for other types of hydrangeas. Hydrangea or Hydrangea macrophylla need porous, humid and nutrient-rich soils. If you do not have this kind of soil in your pot or garden, you can adapt them by adding compost if they are poor in nutrients, or aluminum, sulfur or ammonium sulfate if their pH is very high. To measure the acidity or alkalinity of the soil, a sample can be sent to a nursery or a measuring kit can be used. You can also apply a bit of white wine vinegar on the ground; if it bubbles when making contact with the earth, the acidity is high. On the contrary, if nothing happens, then it has a neutral pH and will give blue flowers. Alternatives to the addition of chemical fertilizers are organic methods such as sawdust, coffee grounds, moss peat, oak leaves or coniferous fertilizer, either from needles or bark, which have a gradual effect. On the other hand, never pour bone meal as fertilizer. The acidity measured by the pH determines the pigmentation of the petals, so manipulating it is the key to obtaining the color we are looking for. The blue flowers occur in aluminum-rich soils with a pH of less than 5.5. With a pH of 5.6 to 6.5, the bushes exhibit an intense purple color, and the soils of greater acidity produce pink hydrangeas. 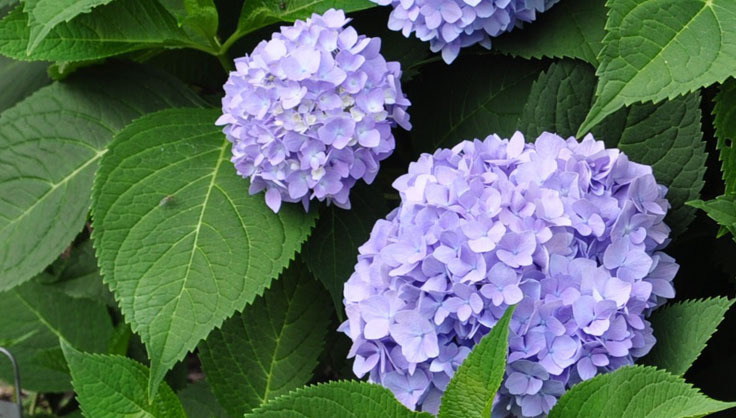 To reduce the alkalinity of the soil and maintain the blue of the hydrangeas, sulfur is placed 10 or 15 cm from the stems. The amount depends on the type of soil and the pH you want to adjust. To a plot of 3×5 m of earth, 350 g is added to reduce the pH in one unit, while if it is sandy or muddy-sandy, less than 115 g is added for the same extension and the same result. Keep in mind that aluminum sulfate should not be poured directly on the root. Watering it dissolved in water stimulates the growth of the plants when they are already mature. 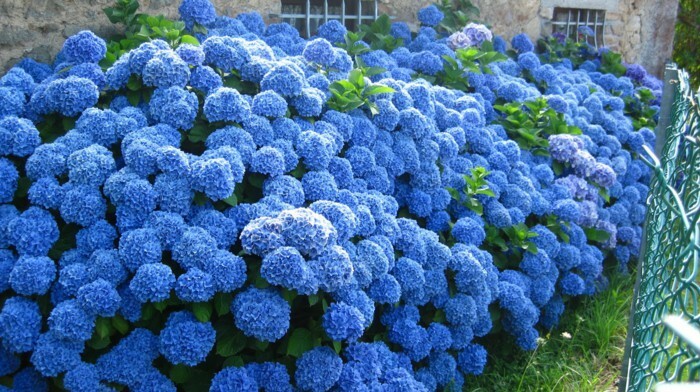 So, if you were wondering how to maintain the blue color of hydrangeas, now you know that it is the use of this product in the water in the right dose and frequency that makes it possible. We must plant the shrub of the blue hydrangea in a place of sun and shade, sunny in the morning and shaded in the afternoon. And it is that the hydrangeas grow in cool places, where they can receive some wind occasionally. We also recommend you check here when to plant hydrangeas. Extreme climates are counterproductive. Therefore, in periods of heat, you must double the frequency of watering. This way you will be preventing the plant from getting dehydrated. Although you must be careful, excess water can also be very harmful. We advise you to water your blue hydrangea with a spray bottle that diffuses the fresh water on the leaves and flowers, keeping the soil moist and without forming mud. Continuous irrigation is convenient until two years after the plant is cultivated. As for the pruning of the hydrangea, know that pruning the stems helps to avoid an uneven growth of the plant beside stimulating flowering. It is important that you consider the ideal time to prune your blue hydrangea. The ideal time for effective pruning is always when the flowers have withered; This usually happens between spring and summer. There is a popular belief that anyone who has grown up in a house with hydrangeas will never find a partner: that person is made to be single. Hydrangea, because it grows in dark and humid places, is associated with negative characteristics such as frigidity, vanity, and hardness of the heart. Bringing hydrangeas to the home of a marriage is an omen that things will end badly for the couple because there will be nothing but fights. But not everything is negative. The floral experts also attribute to the hydrangea positive connotations: it is the symbol of grace, abundance, beauty and felt emotions. To this, we should add that it relates the color blue to peace and relaxation, enigmas and mysteries, harmony, trust, happiness, affection, and love. So giving hydrangeas can mean at the same time that a relationship is already finished and be a gesture with the meaning of asking for forgiveness. ← How to remove bad smell from room?